← Tomato Salad In A Snap! We all have our bad days. Days where you have too many questions and not enough answers. Days when your mind feels full and empty at the same time. Days when you’re sick, tired, or both. Sometimes we need a moment to see the light; something to intervene our thoughts. A great intervention: chicken soup. Soup is an amazing answer to any question, no matter how big or small. It can be an equally good addition to a good day, cold day, lazy day or busy day all the same. Soup clears your mind, fills your insides, warms your heart and brings a smile to your face. It may be my Asian upbringing, but there is nothing better than a hot bowl of noodles and soup. The breakfast, lunch or dinner of champions! The best soup noodles are homemade. You take the time to make a delicious broth and the rest comes easily. The noodles take no time at all, and you can quickly add simple toppings. I make batches of broths to freeze. That way, there’s always a bowl of hot noodle soup waiting to be made in a flash. 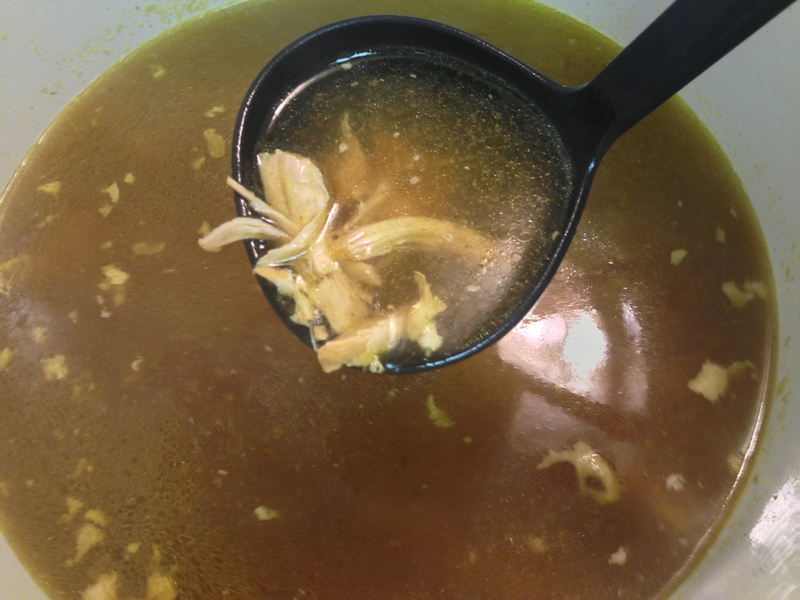 I came across this recipe for Indonesian chicken soup on MoBitesFood, a terrific blog I’ve been following. It’s full of recipes from all over the place, and never disappoints! Check it out! 🙂 I didn’t follow the recipe to a tee. I used the ingredients I could find in my kitchen, and it turned out wonderfully! This broth is full of flavour (spicy curry-like flavour)! For those who love spices, this is definitely for you. For those who find spices intimidating, fear not, this will be the beginning of your spice adventure! Before I threw myself to the (spice) wolves and learned how to work with spices, it was confusing. 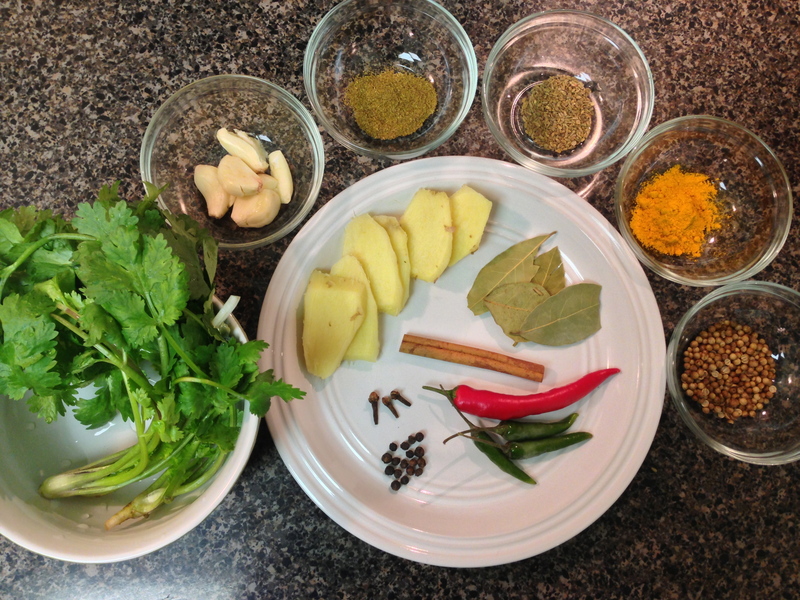 It’s hard to predict how things will taste or which spices to use where, and when to use them. You just have to try! You will be a spice-master in NO TIME. 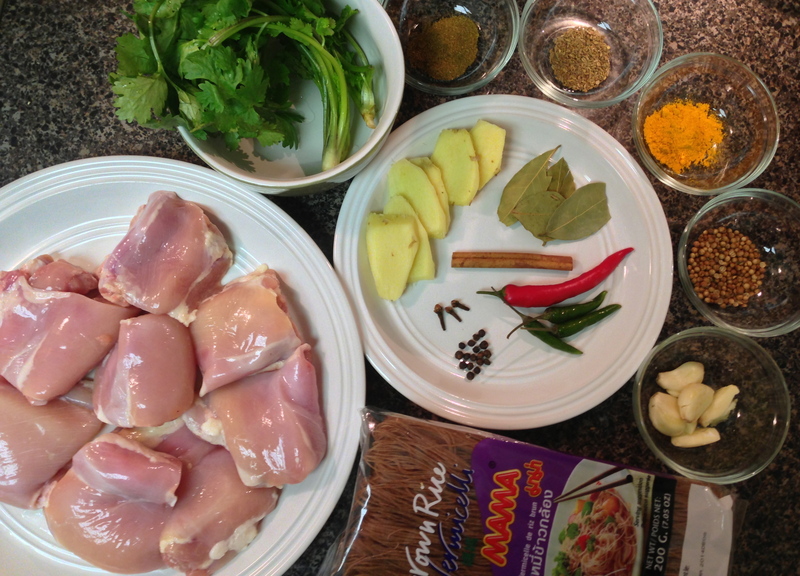 Here’s my version of Indonesian chicken noodle soup. This recipe’s a keeper, I’ll be making this time and time again! 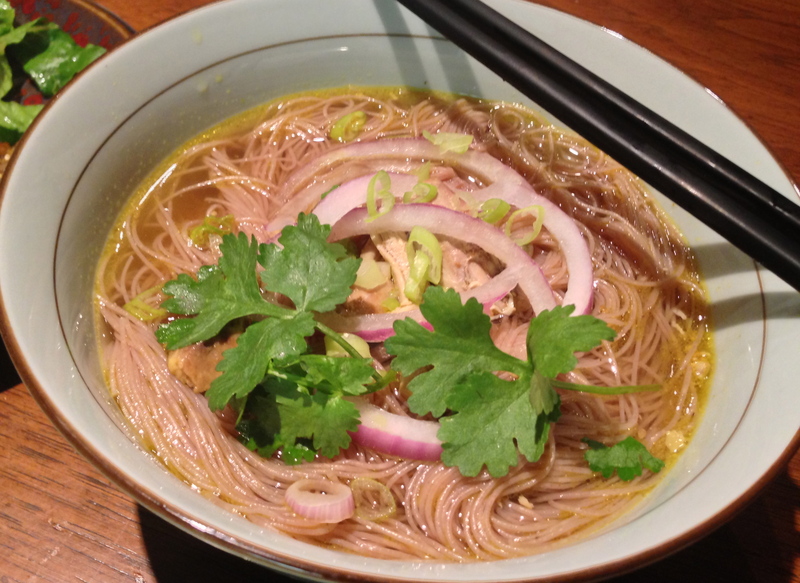 If you like classic Vietnamese pho, this is a great play on the same idea and you’ll love it. You can use any of your favourite Asian noodles. I’ve tried this with brown rice vermicelli and flat rice noodles (used for pho). It would be perfect on a cold winter’s day, but I’m loving it in the summer nonetheless! For vegetarians/vegans: use vegetable broth, and replace chicken with different veggies, tofu or other toppings you like. To give a vegetable broth more flavour you could add some big chunks of carrot or daikon (white radish). Noodles of your choice. I used brown rice vermicelli. Asian noodles will work better, pick your favourite! *Use as many chilies as you like, depending on how spicy you like your food. My broth was quite spicy. 1. Add oil to a large stockpot and bring to medium heat. 2. Toast coriander seeds, cumin, cloves, anise seeds, cinnamon stick, peppercorns and chillies for about 3 minutes. You’ll start to smell a fragrant aroma. DON’T BURN the spices! 3. Add bay leaves, sliced onion, ginger and garlic cloves. Mix together and continue cooking another 2-3 minutes. 4. Lastly, stir in turmeric powder. 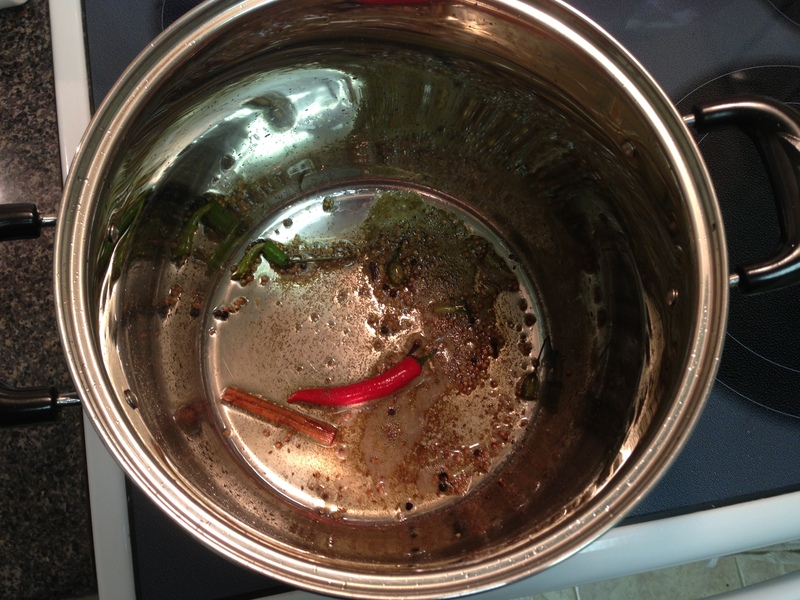 Add a 1/4 cup of water and stir around, scraping off any spices that have stuck to the sides of the pot. 5. Add cilantro sprigs, broth, water, and chicken to the pot. (For veggie option you could add some big chunks of carrot or daikon now.) Bring to a boil and then reduce heat and simmer for 45 minutes. 6. Strain broth through a sieve. Do not through out the chicken. Pick out the chicken and transfer to another bowl, discard all other ingredients. 8. 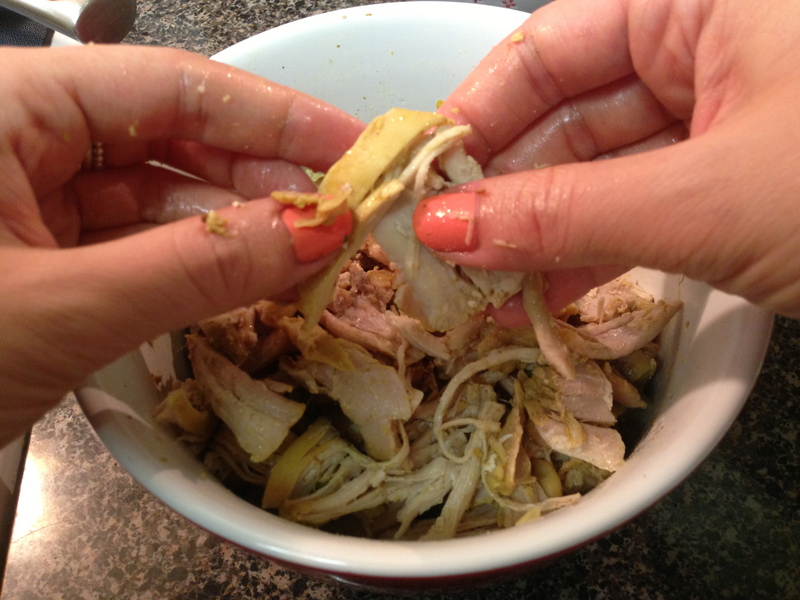 Return the shredded chicken to your broth bring back to a boil and simmer for 15 minutes more. 9. Keep your noodles in mind. Most rice noodles don’t need to be cooked. You can just soak them in room temperature water for about 5 minutes. Depends on the noodles, but I always do this. If you boil them, they’ll be way too soft and soggy sitting in your soup. I soaked mine a few minutes before the soup was done, and then strained them. 10. Bring it all together! Add noodles to each bowl. Cover the noodles in hot soup, making sure you add a good amount of chicken to each bowl. You can top each bowl with additional toppings, or just set the toppings on the table for everyone to help themselves. I made a Thai salad and miso-glazed eggplant to serve with my soup noodles, but sides are definitely not needed. A big bowl will fill you up! Hope you LOVE this soup as much as I did!